We looked at this corner, with its early flatiron building, in an earlier post that took a more distant view of this building. This 1892 Vancouver Public Library view of the Holland Block shows it just completing construction. It was designed by C W H Sansom for James M. Holland, described as ‘an early real estate developer’. Nothing seems to have been recorded of Mr. Holland’s history – other than his middle initial, and his area of employment. Before 1890 he was in partnership with W O Elliot as Real Estate Agents, as his partnership was dissolved that year. He also had interests that year south of the border: “Jas. M. HOLLAND has been appointed agent in Blaine for the Northern Pacific railroad, thus giving Blaine even advantages with other places in securing traveling privileges“. He may have been in a real estate partnership in Blaine as well; the Blaine Journal reporting that “HOLLAND & McFARLAND have just completed them a real estate office at the corner of H and Washington avenue“. In 1891 James M Holland was registered in the Canada census as aged 32, an American and a lawyer. 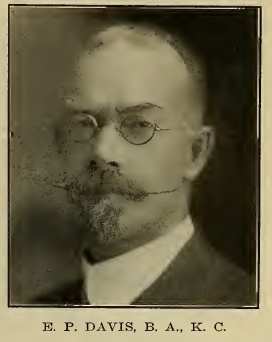 The Daily World confirmed that in 1890, announcing that “James M. Holland, the well known real estate agent of this city, has been admitted as an attorney in the Superior Court of Washington”. He was listed as lodging rather than owning property in the census, which the street directory confirmed; he was living in rooms at the Leland rooms at 131 E Hastings. His offices were on Cordova Street where he dealt in real estate, loans and insurance. 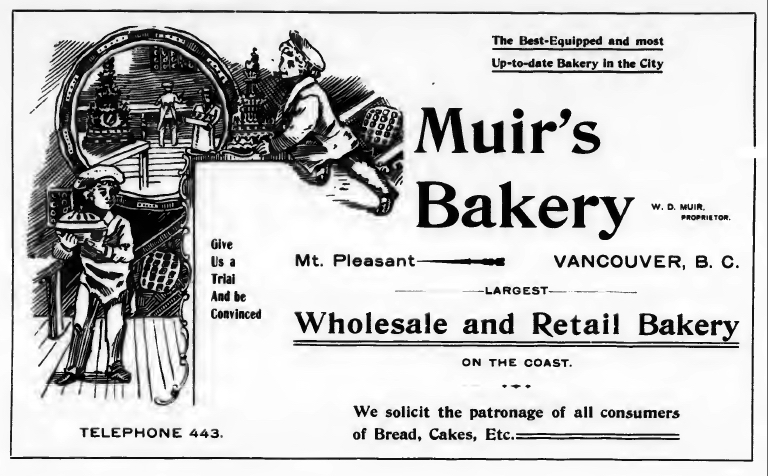 The first time he appears in a directory was in 1888 when he was the manager of the Vancouver Real Estate Exchange. Representatives from 25 companies created and signed a formal constitution and bylaws. The Exchange collapsed after almost three months and 24 meetings; there wouldn’t be a similar organization in the city until 1919. James didn’t stay here too long; the last entry we can find for him was in 1895, when he was listed as a capitalist, and living here, in the Holland Block. He had previously moved to Seattle in 1891, but apparently returned and built this corner building after that. An 1895 announcement suggests he had got married: a Blaine newspaper reported that “Mr. and Mrs. James M. HOLLAND of Vancouver have gone for a visit to New York City.” Earlier that year the Holland Building in Whatcom was destroyed by fire, but was fortunately insured. There the trail goes cold; there are no further references in any Seattle, Vancouver or Blaine publications we can find. 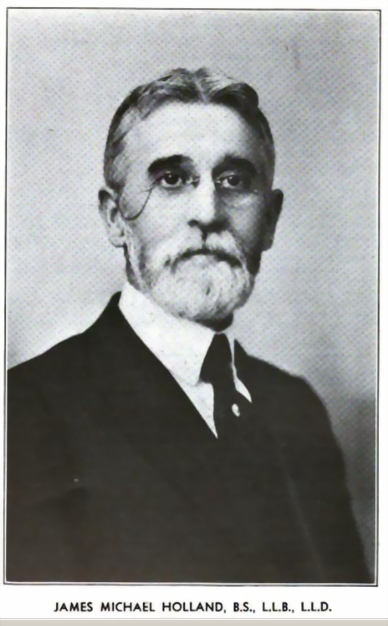 We now know that he initially stayed in New York – James M Holland wrote in 1931 from Wall Street, recalling joining Theta Chi (a fraternal organization) fifty years earlier in Vermont “During fall quarter in 1881, Norwich University was reduced to only 12 students and Theta Chi’s membership was reduced to one undergraduate member, James M. Holland. In November of that year, Phil S. Randall and Henry B. Hersey approached Holland and insisted that they be allowed to join Theta Chi; Holland agreed, thus saving the Fraternity from extinction“. Theta Chi have a history that includes a biography for James Michael Holland, and it includes a reference to him being in Vancouver, so we can be sure it’s the same person. He was born in Northfield, Vermont, in 1859, went to university and then studied law, being called to the Michigan bar in 1884. From 1885 to 1887 he represented a Boston bank in Fargo, North Dakota, then in real estate in both Seattle and Vancouver until 1895. That was the year he married and moved to New York, where he practiced law, engaged in real estate and public utilities, buying, improving and then selling to the municipality the water supply for Northfield. He was a trustee of Norwich University (where he obtained his degree) for 20 years. He died in Northfield in 1944. There’s an antique store trading on the south side (with a red awning), in 22 Water Street, one of the buildings developed by Tommy Roberts. The Mews was the retail complex created from the Nagle Brother garage, built in 1930 on the site of the city’s first firehall. Apart from the addition of the Bruce Carscadden designed infill at 33 Water Street, (and the design of the litter bin) very little seems to have changed in about 45 years, although most of the buildings on the south (left) side have been rebuilt, added to and have residential uses added on the upper floors. The buildings on the edge of the image on the left are a set of Mission styled 1920s stores designed by H H Gillingham. Across Seymour is a theatre, which in this 1973 image was known as the Strand Theatre. Across the lane was the Birks Building, demolished in 1975 with the theatre to allow the construction of the Vancouver Centre. The construction of Birks in 1912 had required the demolition of three early office buildings built by Canadian Pacific directors before 1890. The theatre was opened in August 1920 as the Allen Theater, one of the first super deluxe movie houses in Canada; described in promotional material as ‘Canada’s finest and most modern photoplay theatre’. It cost $300,000 to build and it was completed in only six months. Some reports say that after a year the Allen chain of 50 theatres were bankrupt and theatre was purchased for a nickel on the dollar, reopening as the Strand with 1,950 seats in 1923. Others suggest that the Ontario based Allen family reorganized their operation with US partners, creating the Famous Players brand. The first is more accurate: the Allen family were from Ontario but had moved their operations to Calgary in 1910. They expanded their chain significantly in the late 1910s, often hiring Detroit architect C Howard Crane, (with Kiehler & Schley). This theatre had many modern amenities including built-in cigarette lighters and, in a local touch, featured work by Vancouver sculptor Charles Marega. A decline in movie attendance, the loss of the rights to show Paramount movies and increased competition in the early 1920s did see the company bankrupt, and they sold to Famous Players in 1923 at a significant loss. Most cinemas were renamed as a Capitol – but not in Vancouver where there was already a Capitol down Seymour Street. Both the Allen and Strand featured live vaudeville acts before their movies, sometimes supplied by Fanchon and Marco, (Fanchon Simon and her brother Marco Wolff). Even after relaunching with US backers, the cinemas were not immune to outside economic realities. In 1932, the theater went dark for a year due to the depression; (Fanchon and Marco were booked at the Orpheum instead). Ivan Ackery managed the Strand in 1934 and recalled hired the Dumbells, a touring musical-comedy show formed by a group of soldiers from the 3rd Division, to appear before the movies. Although built as a movie theatre, the stage was large enough to permit use as a regular theatre. In 1940, for example, The Ballet Russe de Monte Carlo performed at the Strand. The show featured a cast of 150, including Alicia Markova. The Beaconsfield is one of the earlier apartment buildings built in the West End. Completed in 1910, the building permit tells us it was designed by J S D Taylor and built by McLean & Fulton at a cost of $85,000. The developer was A J Woodward. The building’s features include the bays filled with wooden balconies and some art nouveau details, with a slightly incongruous Palladian style window in the recessed entrance court. The Victoria based Arthur was born in England, as was Adelaide, his wife, and according to the 1911 census had arrived in 1905 with at least eleven children, all still living at home in 1911, aged from six to twenty-seven. In fact Mr. Woodward had arrived in 1888, and established a large seed and floral business with significant glasshouses and nurseries in both Ross Bay in Victoria and in Kerrisdale. In 1914 The Woodward family built a new British Arts & Craft style home in Saanich. Five years earlier A J Woodward had paid for the construction of a new Gospel Hall in the 1100 block of Seymour Street. We’re pretty confident that it’s the same developer as the apartment building because the architect and builder were the same, (apparently Mr. Taylor’s first Canadian design). For many years this building was ‘women only’, offering apartments to nurses at St Paul’s Hospital. Today the building still offers rental apartments, although the street is closed and the tree canopy almost hides the entire structure in summer, and the cornice has been lost. This substantial office building was designed by Dalton & Eveleigh in 1905 for E P Davis. This 1974 image shows the Philippine Creations store and the Green Parrot Café on the main floor. The only office advertising on its window is for F Gorlich, Foot Specialist. 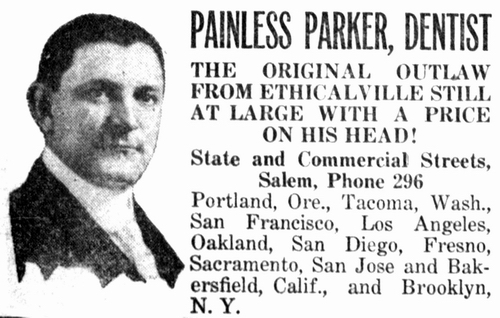 For many years this was the home of Vancouver’s most flamboyantly advertised dentist – ‘Painless Parker’. Although there really was a ‘Painless Parker’ – a dentist who changed his name from Edgar so he didn’t fall foul of the advertising authorities, he didn’t personally carry out the extractions or fillings here. An American, he had a chain of dental offices, with this location in Vancouver operating from the 1930s to past 1950. At 1940 prices of $1 for extractions and $2 for a filling he amassed quite a fortune – By the early 1950s Parker had 28 West Coast dental offices, employing over 70 dentists, and grossing $3 million per year. On the ground floor of this 1940 image was a store frontage for Famous Cloak and Suit Co, shared with the building to the west, the Leland Hotel Annex. As we noted in an earlier post, the building had the 1887 façade designed by N S Hoffar replaced by 1943. That in turn was obscured with the windowless sheet steel shown in the 1974 image above. E P Davis, who developed the 1905 building was an Ontario-born lawyer; a partner in Davis, Marshall & Macneil, Barristers and Solicitors, based in his new building although later moving to the London Building. He was called to the bar in Calgary in 1882, and in British Columbia in 1886 when he arrived here. He lived on Seaton Street and was unanimously recommended for the Chief Justiceship British Columbia in 1902 (a postion he declined, as he had previously in 1898). Owner of a spectacular moustache, he was legal counsel to the Canadian Pacific Railway, and also a Director of Royal Collieries, Ltd. In 1912 he built a mansion designed by Samuel MacLure, on extensive grounds near the tip of Point Grey. Davis named it “Kanakla,” a West Coast native word meaning ‘house on the cliff’. Now part of UBC, it was renamed Cecil Green Park. The Davis Chambers were replaced in 1981 by the 11 storey ‘Princess Building’. That will be the baby on the block in future if the two towers proposed for either side of it get built. There’s a 25 storey tower proposed for the east side, on the corner of Seymour, and a 28 storey office proposed to the west, on the site once occupied by the Leland Hotel Annex. We’ve see the first building that was built here in two earlier posts. It was the site of the city’s post office: a controversial and much fought-over choice of location. The Canadian Pacific Railway Co offered the Federal Government the site on Granville Street at a significant discount from its market value. Of course, the Federal Government had given CP the land a few years earlier to help them decide on Vancouver as the terminus of the railway, so it was only really returning a favour. The benefit to CP was significant – it pulled the city’s important public services westwards, away from the original Granville (the name for the Gastown original city centre) and towards CP’s own Granville; the street with their station, hotel and Opera House located some distance from civilization in the recently cleared forest. After the Post Office operations moved out in 1910 to a newer, and even bigger building nearby, the previous post office was used for the Dominion of Canada Assay Office until 1924. In 1926 the street directory records this location as ‘under construction’ and in 1927, when this Vancouver Public Library image was taken, it housed the offices of the Northern Pacific Railway Co. (We’ve looked at their new station, built in 1919 on the reclaimed False Creek Flats, designed by Pratt and Ross of Winnipeg). We haven’t identified the architect of this building, and initially we thought the railway company were the developers as it was called the Northern Pacific Building into the 1930s, although the railway soon stopped occupying main floor space in the building, their corner office replaced in 1935 by Christie’s Shoes. Thanks to Patrick Gunn’s research we now know it wasn’t the railway company, but Mr. A J Buttimer who developed the building, with Dominion Construction building it at a cost of $65,000. Dominion may have used their in-house designers, as no architect is identified on the permit or in the newspaper story. Pender Place, a pair of office towers designed by Underwood, McKinley, Wilson & Smith now occupies the spot.